1. A large group of unsuspecting people, about to be hit by something they will take a long time to recover from. 2. A precursor to bad news for large groups of people. India: from the Hindi word Mitron, ironically meaning 'friends'. In recent times, however, it has been used to brutal effect to make a series of anti-people announcements. Let's see what happens this series. 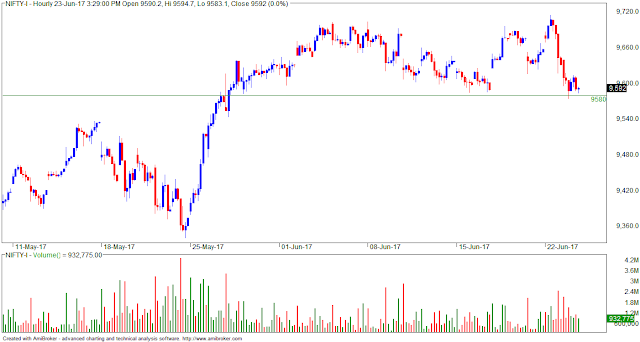 - today NF closed flat amidst large swings. - above are bullish indicators. 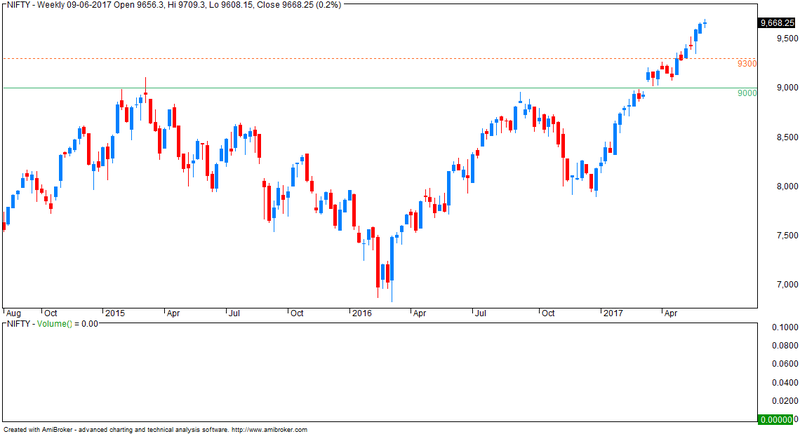 - tomorrow, holding 9470 spot or above today's highs (9575 spot) will be bullish. 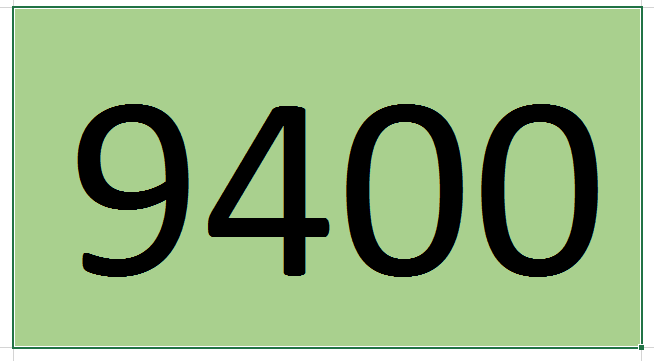 Option writers bullish that 9400 will hold in JULY.... this means more upsides until they start writing calls. NIFTY triangle size 200 points... so where is it headed? 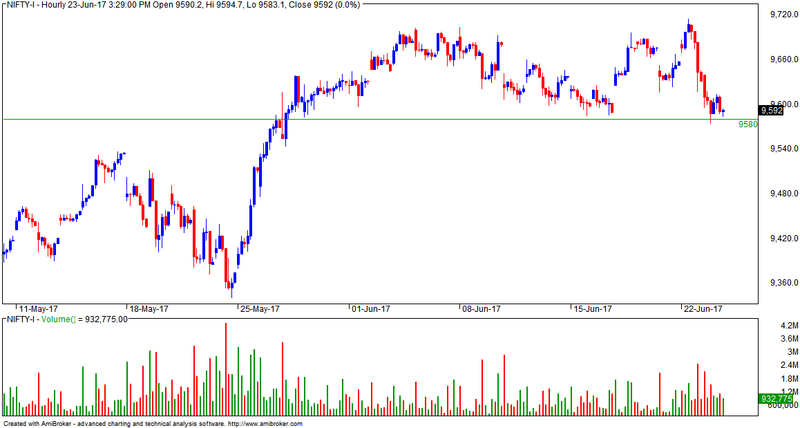 - today, NF closed flat. There is no reason for an intelligent person to use leverage as he will get rich anyways, and if you are not intelligent, god forbid, leverage is the last thing you need. ....Sensex itself showed “Inverted Hammer” like candle on its Weekly chart. 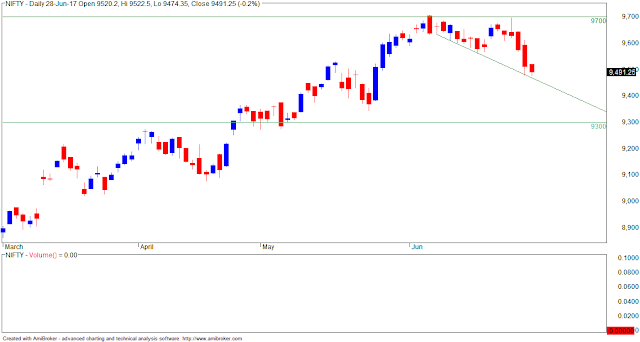 A decisive weakness & close below its bottom would be considered as -ve follow-up to the bearish pattern. All in all, it looks like “g” leg has been a substandard up-move as compared to previous up-moves of “a”, “c” and “e” legs. 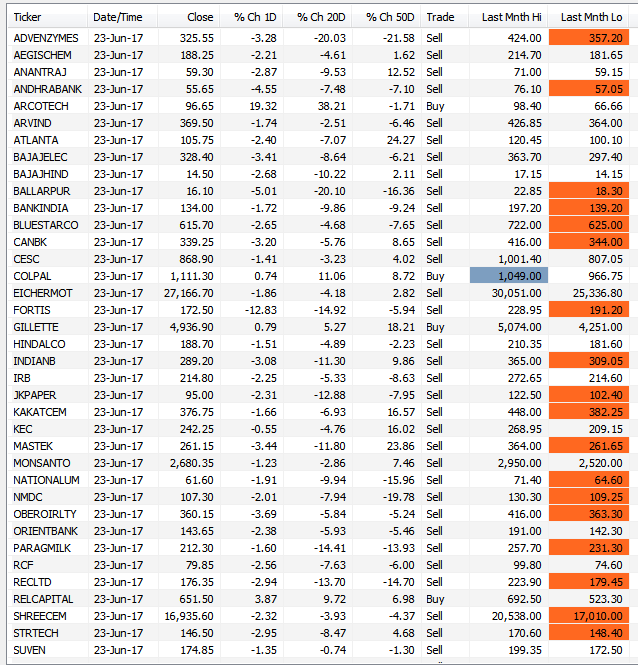 Price-wise, “g” so far measures only about 500 Sensex pts against 1000 Sensex pts achieved by the previous up-moves. The internal lower-degree development inside “g” can be checked on Intra-day chart, as per which, the fall of Thursday-Friday can be marked as the possible lower-degree d-leg of such Extracting Triangle. So… What is Risk management ? Cutting to the chase, in very simple terms, I define Risk Management as a plan to ensure that I live to see another day. That is it. That is all there is to it. If the worse that can happen, does not kill you, rest of it would be only the upside. What is an Uncle Point? Excellent interview with Mohnish Pabrai ... must see for all investors and people losing money big time in futures/ options. This is a Hammer.. this can be bullish or bearish depending on where it happens. 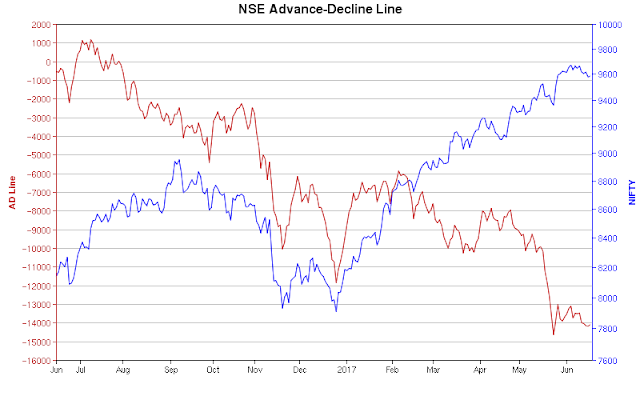 After a strong uptrend, this has bearish implications and vice versa. Understanding the psychology of market participants will explain everything. And this is an Inverted Hammer... sometimes known as shooting star (suggesting bearishness). Ideally MTM on close should have been 40K but made some bad exits. - below this, expect deeper correction. GST is not simply one nation one tax. It is 4 tax slabs, 3 types of GST, 3 returns per month and 37 returns per year. This report is for educational purposes only and is not recommended for trading or investment. Liquidity filter: ||||| excellent liquidity - ||||| good liquidity - ||||| low liquidity. - today, NF closed flat at 9653. The question for the fresh week, therefore, is whether “f” is now completed, and whether an upward “g” leg would open from here. As an initial sign than “f” is over and upward “g” is opening, Index needs to strengthen & close above its previous day’s high. The question is also whether “f” would be completely retraced upwards in “faster” time. Previously, 8-day “b” leg was fully retraced in a day. 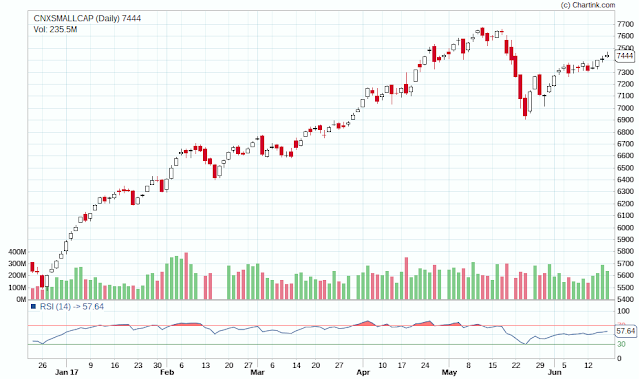 Similarly, 5-day long “d” leg was also fully retraced in a day. We cannot, therefore, rule out that if an upward “g” leg opens, it can retrace the 8-day long “f” leg within a day or 2, which could make shorts to run for cover like the last 2 times. On Sensex, the 5-day lows are similar, 31044-62-55-26-17, from Monday to Friday of the Week. All these values are also close to the Grey channel. So, a Bull candle holding around 31K, can be an initial +ve sign. This, followed by strength/close above Fri’s high (31183/9616), could mean that the downward “f” leg may be over, and upward “g” leg is opening. As already warned, “g” can be a strong up-move. 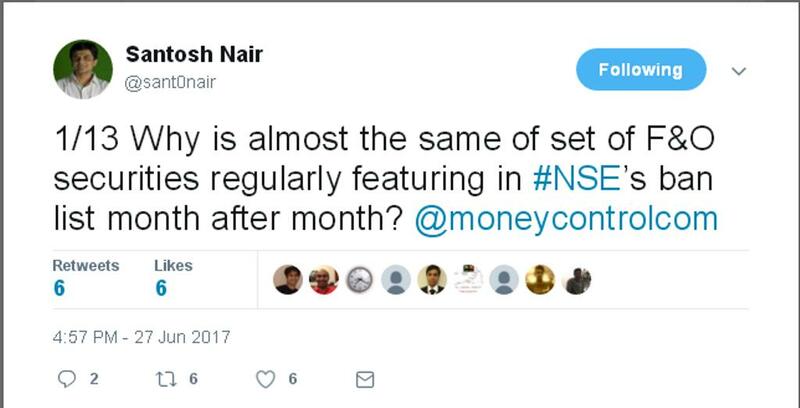 Small caps set for more correction? 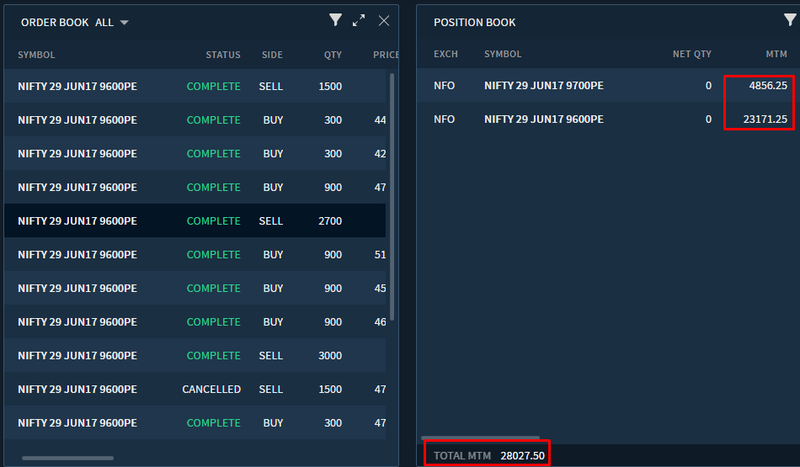 After a long time, I am seeing highest OI in a call... limited upsides? We are happy to announce the launch of AmiBroker AFL Bridge for Upstox. Starting today, you can link AmiBroker strategies to Upstox Pro Web. Using the Upstox Bridge to AmiBroker AFL you can finally fire orders from AmiBroker to Upstox Pro Web. The best way to learn about the Upstox Bridge to AmiBroker AFL is to attend the upcoming webinar. You can learn everything you need to know about installing the new product from our LIVE webinar. Also, check out this blog by Upstox co-founder Shrini Viswanath about the Upstox Bridge to AmiBroker. Looking forward to seeing you at the webinar! Short summary - correlation does not imply causation. But this is very difficult for the common man to accept as it goes against his very grain of thinking. So I came up with this topic of how skirt lengths influence the stock market and vice versa. This is what Google search threw up... you can think of any number of silly variables and try and correlate this with stock market movement. May 11, 2015 - Nobel Prize-winning economist Robert Shiller of Yale talks about skirt lengths as a predictor of stock market prices. Sep 2, 2007 - ... used as a barometer to determine the outlook of the stock market. Though market analysts didn't pick up on the connection at the time, the Skirt Length Theory, an indicator of market value and consumer behavior, was born. - reduction in 9700 and 9800 CE (some more upsides?). 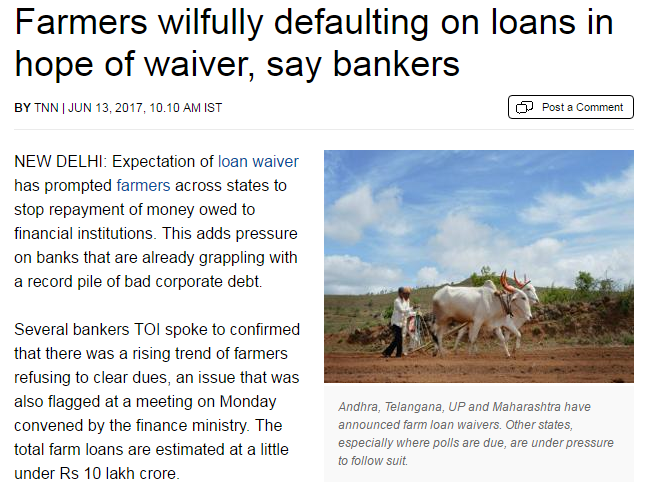 Loan waiver: first UP, now Maharashtra. Next MP? 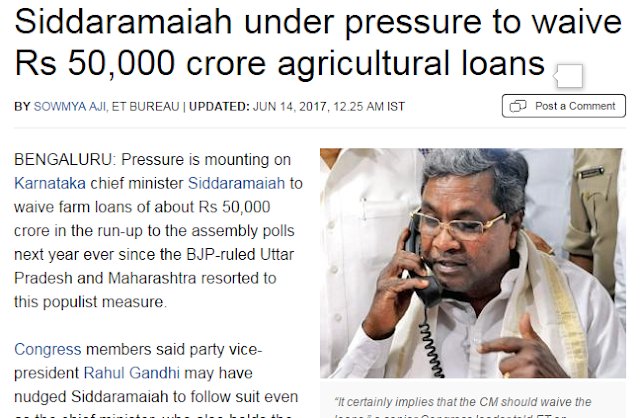 Gujarat? Punjab? What about the honest farmer who has diligently repaid his loans? He looks like a fool now. Put differently, there is no longer any incentive to repay loans. And this is bad news for banks and micro finance companies. ...So, if now the upward leg “e” leg is over, the question is whether the downward “f” leg would also consume a total period of 5-8 days and drop closer to the top of “c” leg. 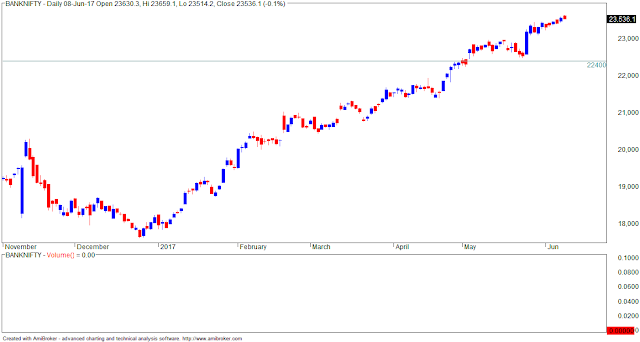 In other words, we may watch if the downward “f” leg consumes 2-5 days more from here, time-wise, and if it drops closer to 30712 (Nifty 9533) which was the top of “c” leg, price-wise. 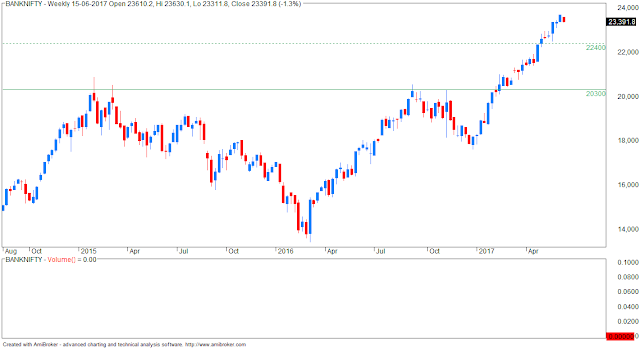 Friday’s action itself looked significant because it initially broke the 5-day lows of 31172-98 (Nifty 9630-40), but as Bulls came in at lower levels, it avoided any decisive close below the 5-day lows. 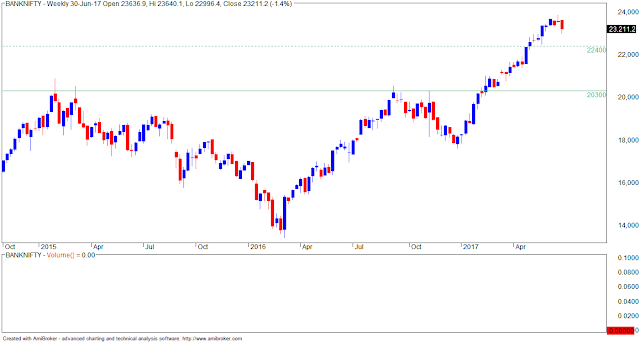 As a result, Friday’s action formed into a Thrusting Line Bull candle, which can open sideways to +ve options on further follow-up strength & close above its Head at 31290 (Nifty 9676). That could prove challenging, as the initial cues appear -ve as we begin trading a fresh week. 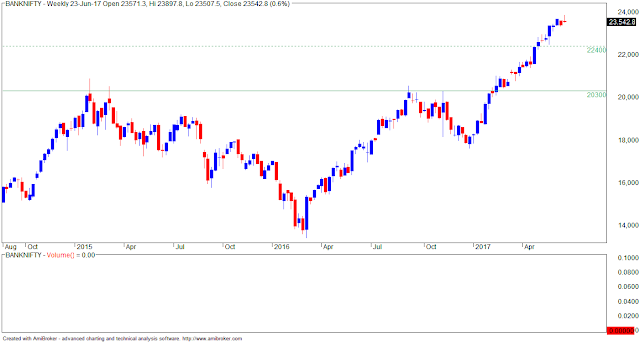 Nifty opened mild lower at 9638 and declined further to register day’s low 9608 but bounced again from lower levels to register day’s high 9676 before closing 21 points up at 9668. 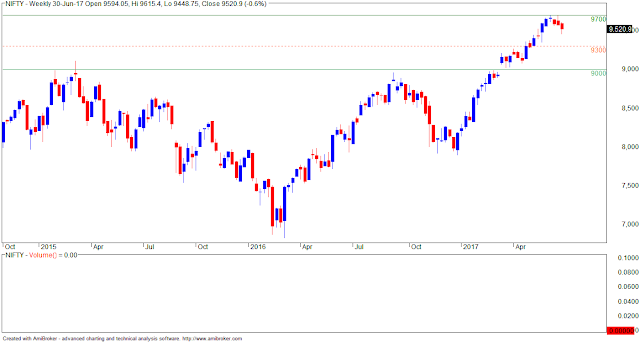 Friday, a corrective decline towards 9622-9658 was expected and trading strategy was to hold Nifty shorts taken in 9679-9709 using fresh stoploss of 9689 expecting same target 9622-9568. Nifty declined further to achieve minimum target 9622, registered low 9608 but bounced again towards 9676. 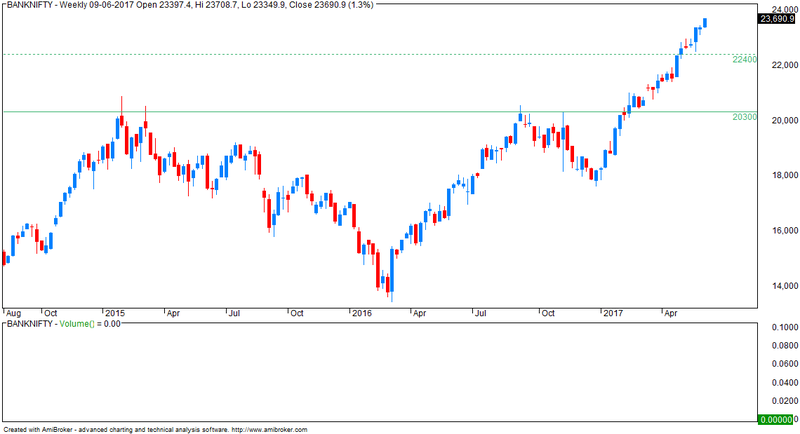 Let’s have a fresh look at latest charts for further scenario. Note: this article was posted on 7-JUN. 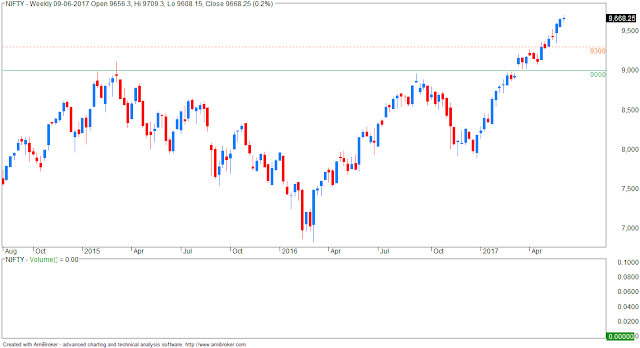 Nifty opened higher at 9704 and registered new all time high 9709 but failed to sustain at higher levels and decline back sharply to register day’s low 9630 before closing 37 points down at 9637. 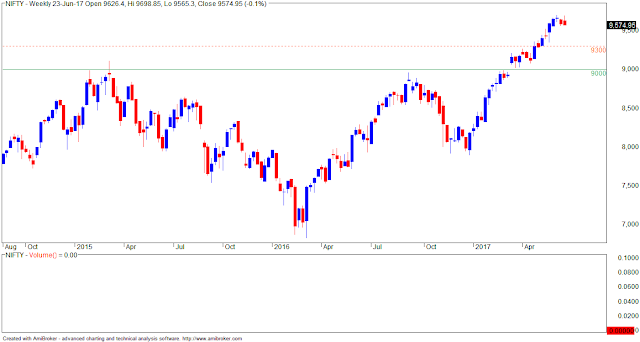 Friday, Nifty was expected to bounce towards 9706-9779 at least in near term and 9649 was short term reversal or breakeven point. And suggested to hold Nifty longs taken in 9590-9581 range on last Thursday expecting minimum extended targets 9706-9779. 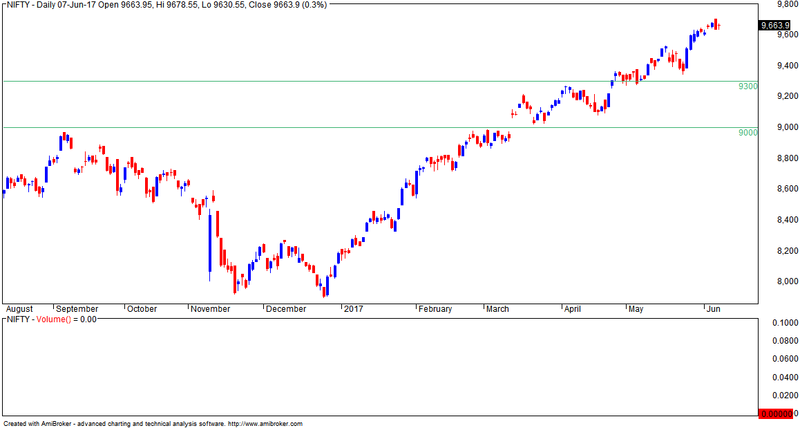 Nifty achieved minimum target 9706 and then decline back. Let’s have a fresh look at latest charts for further scenario. Steve Schwarzman is the founder and CEO of Blackstone Group, the largest alternative investment firm in the world (AUM USD 300 billion). We’ve had a different strategy all along. One part was to be in the advisory business; it required no capital and generated cash, which we could use to hire more people without diluting. Second, to get into the private equity business; it was a great business and still is. And the third was to find other fantastic investment opportunities from a risk-reward perspective. So that was our strategy from Day One. I was sort of in the last generation of people in finance who did everything. It was before specialization. If you were in corporate finance at that time, like I was, you were doing mergers, IPOs, debt deals, debt for equity swaps, restructuring—anything that needed to be done you did. And because you were seeing the entire field in play, you realized that nothing lasted forever. There are no patents in finance. Everything has a decay curve, in terms of its margins. You had to be in the continual invention business to do well. I just took it for granted that we had to keep inventing new things all the time. When we went into the crisis, we already had the platforms. As the opportunities presented themselves, all of our businesses were in great shape. We didn’t have to deal with the world of problems. We were good underwriters, and the opportunities were profound—they were almost everywhere. And so that enabled us to enter those different business lines further. We basically raised very, very large-scale capital from everyone we could. The more successful the outcome, the more they wanted to give us. And it became a virtuous circle of doing well for them, looking for new opportunities whenever we could, and them giving us very large amounts of capital. Our timing was right for all of these different opportunities. The system we designed, of being able to see across asset classes and controlling risk, informed us where we should be and not be, which enabled us to grow very large-scale businesses with a small number of people. I think for people who weren’t set up like that, it was much more difficult. I must admit that our call on TVS has gone wrong consistently, because from Rs 270 onwards, we kept a sell rating on TVS,” said Daljeet Singh Kohli of IndiaNiveshBSE -0.12 %. 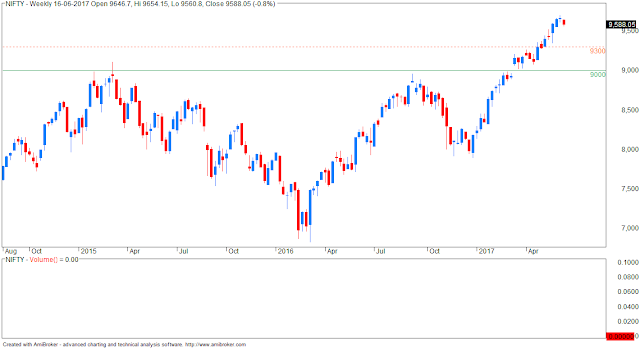 The stock was trading at Rs 535 on Tuesday. Kohli said his thesis for the ‘sell’ rating was based on the fact that the stock was trading at twice the multiple of Hero Honda and Bajaj, whereas margin profile was half of theirs. Even return ratios were half of theirs. “Going by valuation theory and on pure fundamentals, it does not make sense to go for a company that is making half the margins to trade at double the valuation of its peer,” Kohli said. Question: of what use is your fundamental analysis if you cannot make money? There are no brave old people in finance. So part of what benefited us was that we’re risk-averse. I have a saying: There are no brave old people in finance. Because if you’re brave, you mostly get destroyed in your 30s and 40s. But if you make it to your 50s and 60s and you’re still prospering, you have a very good sense of how to avoid problems and when to be conservative or aggressive with your investments. India’s growth story is so compelling, investors are willing to ignore years of flat and even declining earnings in the hope that the elusive growth will come about at some point in the future. Ridham Desai of Morgan Stanley believes that it’s the technology stocks that could well turn out to be the dark horse for Indian markets. The India equity head of research and managing director at the global investment bank told BloombergQuint that higher capital spending by American corporates will more than compensate for the visa hurdle that Indian I.T. companies have been facing lately. While the “structural story is still bad”, there could be a surprise waiting, he said on the sidelines of the Morgan Stanley 19th India Summit. Benchmark Indian equities, already at record levels, are set to head even higher, said Desai. 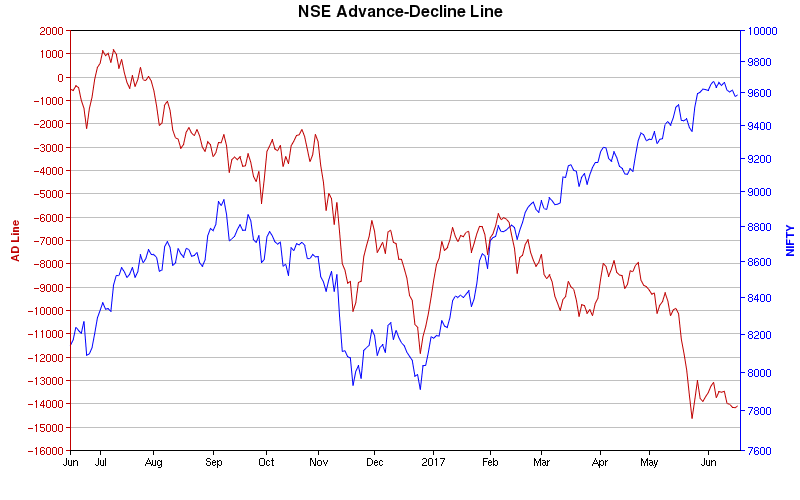 Indian stocks are one of the biggest gainers of “secular global bull run” that’s underway, he added. Here are some of other key takeaways from Desai’s conversation with BloombergQuint. At the 2nd Annual Sohn India Investment Conference, top investors regionally and around the world will convene for a day of fresh market insights. India’s open-ended growth lends itself to new and compelling investment ideas. Funds will go to support cutting-edge pediatric cancer care at the Tata Memorial Centre in Mumbai, recognized as one of the leading cancer centers in South Asia. He analyzed the Company using his QGLP model. Its a business with secular growth drivers.India’s Mortgage to GDP is very low (9%) and level of urbanization is only 33%.Both these figures can only go up. For all practical purposes, it is Carlyle which owns 38% of the company is running the business.They have put in top class processes and practices. The management plans to double assets by 2020. Modi’s ‘Housing For All’ can create a 50L Crores Mortgage Market.